Continuing GUI tutorial. As I have already mentioned, any dialog in ArmA is a combination of TYPE and STYLE. Type defines the basic functionality of the dialog, whether it is a simple box or a list or a button or maybe a slider. There is even a type for in-game map as well. Style defines other variations in dialog appearance or basic functionality. Some may requite additional parameters. Have a look at the picture below. The blue box in the centre is your anchor. It is exactly the same on every monitor and every screen. It is always 4:3, it is always positioned at 0,0 and its size is always 1×1. This is why when you build your GUI, the positioning and sizes of your elements will be calculated relative to this box. For example if you say your GUI element width is 0.5 (w = 0.5;) this means that it will be half of the width of the blue box since width of the blue box is 1. Keep in mind that the blue box is not square therefore w = 0.5; is not equal to h = 0.5; in screen size. As you can see I have a single monitor so safeZoneX == safeZoneXAbs and safeZoneW == safeZoneWAbs. If you want to position your dialog top left corner it is pretty straight forward. If you want to put it bottom right corner you need to find out the bottom right corner x and y first then subtract the width and the height of your box from them. Check the diagram at the beginning of this tutorial part for reference. This is it for this part. Styles next. Thanks a lot for writing this tutorial. Could you upload the Solitaire mission so that we may study and learn from it? I, for one, would really appreciate it. KillzoneKId can you make Video Tutorial?. 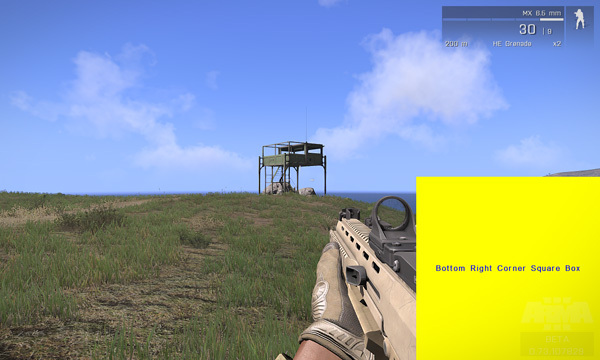 Can someone please make a tutorial how to use ARMA 3 GUI EDITOR. PLEASE SOMEONE! Thanks to killzone Kid for these infos. There is nothing more hard to understand. Well! as example, my monitor is a 51cm/29cm. This should mean a 1.775862 full screen ratio. Not sure! My setting is a 1920:1080 native 16:9 resolution with a 16:9 aspect ratio. If I hint getresolution and safezone, the result is…. - getresolution select 2 = 792 (viewport 2D wide), well something to do with that? SafezoneW = 2.42424 , why not? SafezoneW/SafezoneH = (2.42424/1.81818) = 1.33333. Oups! in 16:9 everywhere? For sure, many numbers to manage! Safezone has no dimension and you can’t compare H and W. It’s impossible to obtain a square with : x=..,y=..,w=0.1*safezoneW,h=0.1*safezoneW. In other terms : safezoneW*safezoneW isn’t a square. As for the rest, you can try many combination as getResolution select 2 / getresolution select 3, i’m still looking for the good formula to keep an HUD circle in a good ratio for all the display possibilities in Arma. No joy till yet!